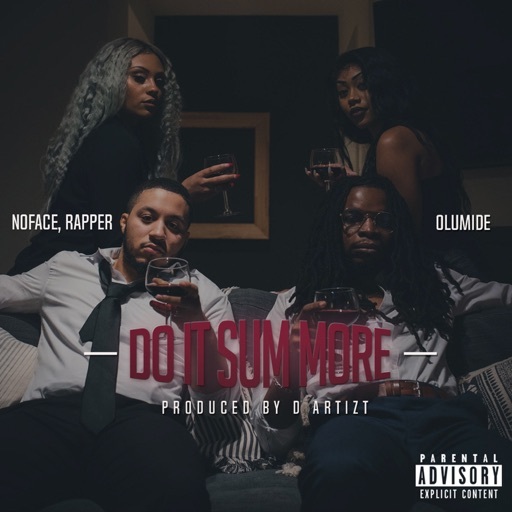 Home / DMV Hip-Hop / Do It Sum More / hip-hop / new music / New SOTBMusic / NFR / NoFace Rapper / Olumide / SOTBMusic / New SOTBMusic: Olumide and NoFace, Rapper Link Up for "Do It Sum More"
Olumide and NoFace, Rapper recently dropped a new collaboration and, yes, it's pretty awesome. "Do It Sum More" brings their distinct flavors together to create something that feels very Curren$y and Wiz Khalifa-like in its approach. Perhaps it's fitting that it dropped around the same time as 2009. These two artists mesh as well as Spitta and Wiz on this one. Over a smoothed-out D'Artizt instrumental, Olumide and NFR talk their ish and aim their game at a beautiful, educated woman who still knows how to get it in. Olumide takes a more melodic approach at times, flowing on the beat about how he does things. Meanwhile, NoFace branches out (just as we discussed in our interview earlier this year) and close out the track with an energy that's part old-school game-spitting and part new-school recognition of beauty and excellence. With the video dropping on Valentine's Day, now is as good of a time as ever to get introduced to this collaboration. Check it out below on various streaming platforms and remember to support dope music in all its forms. UPDATE 2-15-19: The video for "Do It Sum More" is now live. Check it out at this link.